9/11….I don’t really talk about it…. We all have a story about 9/11. I was in one of the last subways going into lower Manhattan that turned back in the tunnel. I was living in NYC in September of 2011. A few days after the attacks, my now ex-husband encouraged me to write down what happened to me on September 11, that day with the bright blue sky. It was a regular Tuesday morning for me. I was running around on the top floor of our brownstone, the television on just for noise while I was getting ready. I was packing my bag for the day; I wasn’t really listening to the television until I heard the word fire. I looked up at the t.v. and I saw the World Trade Center on fire. I thought my god, those poor people, and such a fluke accident. I thought a news helicopter or something got to close to the building. So naive was I. I had no idea what had just happened. My husband was still sleeping, so I kissed him goodbye and I set off for work. I got down to the subway; it took a while for the train to come. I knew that the MTA would be cautious because of what was going on at the towers. Still at this time I had know idea what was really happening. I still thought it was just an accident. Finally my train came, I got on. People this morning were really chatty. I heard pieces of conversation; “…a plane flew into the building!”. Each time the train would stop for passengers, the wait for the train to take off again took longer and longer. My normal commute from Bayridge Brooklyn to Carnegie Hall in Midtown Manhattan is between 35 – 45 minutes. One hour and ten minutes into my commute, we have finally passed the last station in Brooklyn and we were in the tunnel under the river. About half way through, the train went backwards and stopped at Court Street, about 90 blocks where I live. The train conductor came on to the loud speaker, “Due to terrible circumstances at the World Trade Center, no trains are going to Manhattan at this time. We advise that you go home and listen to the news.” The whole time this gentleman had a tremor in his voice. By the end of his announcement you could tell he was crying. I still at this point really had no idea what was going on. I waited my turn in line to get out of the subway station. When I got to street level, thousands of people were standing around looking in the direction of southern Manhattan. All you could see was a dark cloud over the lower part of the city. I walked up a block from the subway station, turned on my cell phone and tried to call my boss to let him know I couldn’t get to work. My cell phone was not working. I walked three blocks south and finally found a phone no one was using. I got through to my boss, he asked me if I was ok, he told me not to come in, just go home, he would call me later and we would figure out what was going to happen for Wednesday. After talking to my boss I called my husband, George. He was so relieved to hear from me. “I’ve been waiting for you to call. One of the World Trade Center buildings has collapsed. They’re saying on the news it is a terrorist attack. I can’t believe it, the building is gone, its not there. Where are you?” I didn’t realize that I was repeating what my husband was saying. A woman waiting for the phone behind me fell to her knees on the ground and grabbed on to my leg and was crying, “Oh, my god!!! Which building, my husband works in the towers, which building!! !” I looked at her and said I am sorry that I didn’t know. George told me to start walking home and he would start walking to meet up with me. When I got off the phone, I could hear these random cries, screaming from people. “My brother, my brother is in tower two!!!! I can’t find my husband, he works in the towers! My cell phone doesn’t work, I need to call my husband!” I didn’t know what I could do to help. The only thing I knew was I had to get back home. I started my long walk, alone. I’m walking in a daze; I keep looking over my shoulder at the black cloud over the city. About 6 blocks into my walk home, the wind direction changed. I was walking into a grayish cloud of dust. The air was very thick with ash and it was getting harder and harder to breath. The smell was horrible. I looked down at my clothes and I was covered with this thick dust. It was in my hair, my ears, it was stuck to my cell phone, there was ash in my purse and I could taste its bitterness in my mouth. I realized then that I was not just walking through ash; I was walking through the after math of a very violent act. The ash was remnants of a building, of innocent people. I will never forget that smell, it was the smell of death. My husband met up with me about 40 blocks later. I was covered in soot and I was having trouble breathing. He hugged me hard, he was so worried and so happy to see me at the same time. He then told me that both buildings were gone. My heart fell to my stomach. People were in their cars trying to get out of Brooklyn. People around us were crying and they were scared. I was scared. I never knew what feeling terrified was like. I know now. Last night I had a dream, I was walking home again those 90 blocks. And again every time I looked down at my clothes, at the ash collecting on my person, I started crying. I could smell that smell again. When I woke up and my husband was closing the windows in the apartment. He said there had been a shift in the wind. The smell was now in my home. It was in my home. In the 28 years I have lived on this planet, the life experiences I have had thus far, never in my wildest dreams did I think this would happen to my country. Who ever did this to us, if you think you’re trying to scare us, to make us feel unsafe, you have….but just for a while. You can make me feel afraid, terrified and scared. But you see I’m an American you can not take away my courage and my freedom. My ancestors, grandfathers and father have fought for my freedom and for the freedom of those in this country. I never realized really what freedom was until that horrible Tuesday morning, when I saw with my own eyes and tasted in my own mouth that you were trying to take away from me. But we’re a proud people, an honest people and a people united. We will as a country come together as one and overcome this horrible tragedy. We will not let those you have killed die in vain. Remember we are the UNITED STATES of AMERICA. I have the honor and have been given the privilege to live in this fair and just land. I’m an American and I humbled and proud to call myself one. 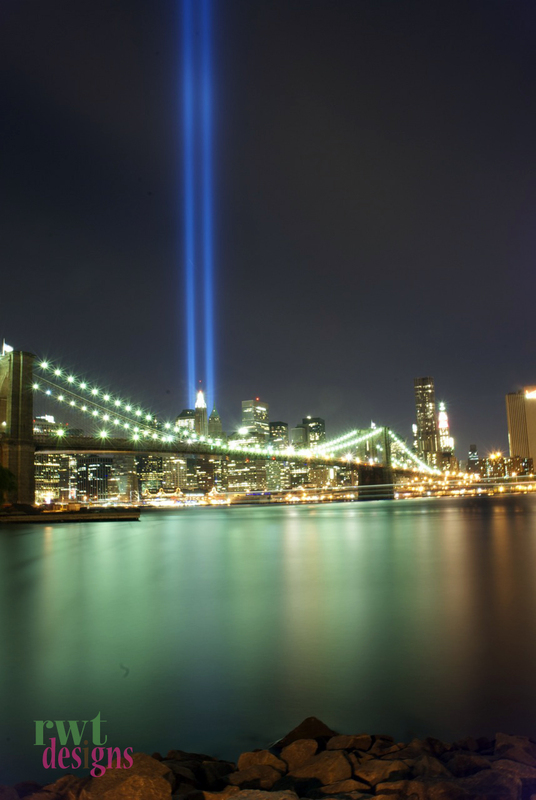 9/11 changed my country, my city and my life. Three weeks after the attack, we moved. My marriage barely lasted three years. In the process of my divorce, my parents encouraged me to find happiness again and move back to the city I loved. I went through a few years of job hopping and then I ended up working for Ron. I took this picture in 2010 of the memorial lights. Little did I know that there would be a baker down at Ground Zero handing out pieces of cake that was left over from canceled weddings to the workers who were there in the rescue efforts. Little did I know that the chain events in my life after 9/11 would bring me to work with that same baker. NYC is not the same, but it’s the city I choose to call home. I get up everyday and take the express train to work over the Manhattan Bridge that overlooks the southern tip of the city. I still have a little ache in my heart at the emptiness of the skyline that I see each morning. But I go to work knowing everyday that celebrations are planned and the people in my city has found happiness once again. 9/11 will forever be etched in my memory. I remember every detail about that day. I live in Scotland and was working in Woolworths at the time when a colleague came in, in a panic saying that a plane had flown into the world trade centre. I had no idea what the world trade centre was, so had images of some really light aircraft flying into some ordinary building, so didn’t understand why she was panicking. On my lunch break I went out to the local electronic shop, where basically every other shopper was, watching the news unfold on the TV and I just remember staring in disbelief. I couldn’t get my head around what I was seeing. The next 48 hours were surreal. Things just got more and more horrific as the time passed. I remember sitting in my bedroom crying watching the news, watching people jumping from the building and not being able to comprehend how bad things were in the building, that made jumping seem like the better option. Then watching the buildings coming down and people being consumed in the debris. Simply put it’s a memory that will stay with me forever. I had booked to go to NY in the January of 2002, but we cancelled just after 9/11, but we made it back in December 2004 and it was the best holiday I’ve ever been on. We visited ground zero and it was so strange to be standing in the very place that I had watched countless times on the news. For me, the skyline might have changed, but NY remains an amazing city and that is something that the tragedy could not take away. Thank you for sharing your post. While I live in Texas and we are currently going through fires around us, and I have not been in the middle of a disaster with so many people involved, we, my sweet husband and I, had a life changing experience when the economy fell apart a few years ago. Although, things are not back to normal, we certainly can look back and see the many miracles that happened in our lives over that time. Thank you for sharing your story and reminding me how far we have come in just a short period of time. I believe that God does not take us where He cannot use us or teach us. Your journey brought you back to happiness and healing. Who would have ever thought that one day you would be working with someone who could share your experience. God bless you both. your post made me cry. thank you for sharing it. To share your experience with everyone is powerful. Thank you for sharing. It was a world changing event thank you for sharing some thing that changed you world. Prayers to you and the people who died on that day. Thank you for sharing, praying always for those whose world changed on that horrific day. Thank you for sharing such a personal story. I love the thought of Ron handing out cake in the midst of that tragedy. May God continue to bless you and our entire country.